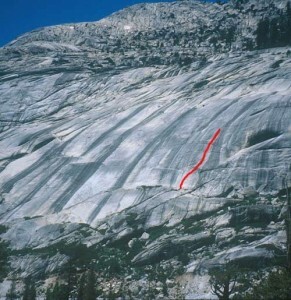 With excellent, varied climbing up a slick white dike, Mere Image is the best, and oldest, climb at the crag. The widely spaced 1/4” bolts scared many off for years, but they were replaced by the ASCA in June 2002. While the dike is very slippery, the climbing meanders around on knobs and edges and only rarely gets near or on the dike. Which SuperTopo guidebooks include a topo for Mere Image?